Target Marketing creates all of its maps from the most up to date and current GIS data available thus giving the end user the confidence and peace of mind that they will find their destination, the points of interest along the way, and all done at an accurate and easy to use scale so that the traveler or resident can properly estimate time and distance. Many of our custom sponsors acknowledge that providing their clients, customers and business partners with a useful token of appreciation is a good business practice and one which typically generates more business and more referrals down the line. 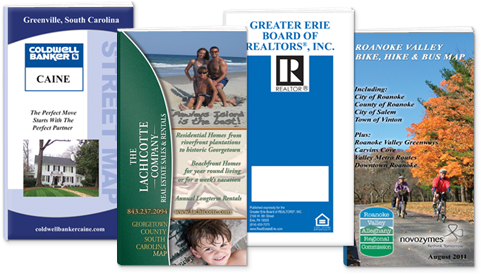 Target Marketing has countless publishing partners that rely on us to provide, print and deliver to them the perfect business marketing piece. Insurance agents, professional realtors, major medical facilities, colleges and universities and home inspectors are just a few of the business markets that benefit by supplying their partners and clients with a very useful area map while reminding the end user of the business partner that provided such a tool. You have seen the calendars, the ink pens, the mouse pads, stress balls, paper clip holders and countless other promotional items that rarely are around six months later. An accurate area map is a resource that is kept and used many time over and for many years.